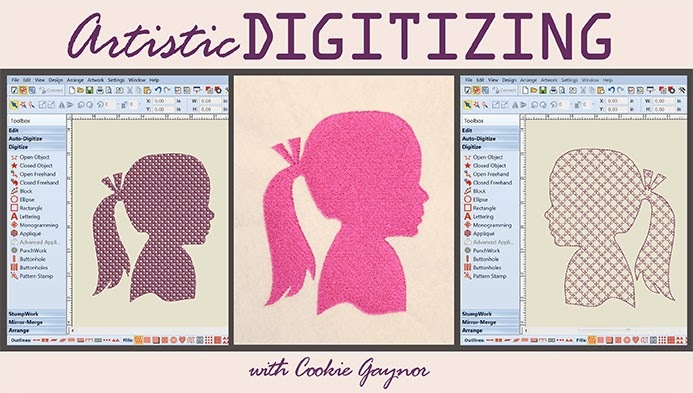 Cookie's Embroidery and Sewing Creations: Create your own embroidery designs and why! Create your own embroidery designs and why! 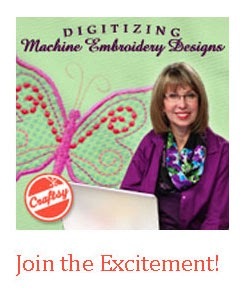 Join: Digitizing Machine Embroidery Designs on Craftsy! If you love your embroidery machine and have developed an addiction to collecting designs, you may ask yourself: why do I need digitizing software with so many designs on the market? The answer is simple: personalization! There are many beautiful, whimsical, and stylish designs on the market, that is true. However, most recipients of embroidered gifts truly love personalized items. You know this statement is true just by the number of embroidery shops you see locally in your area. When you walk into a shop, first you notice the type of "blanks" that they have, and then you note how you can make it especially personal for the friend or family recipient. 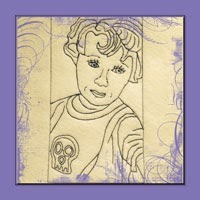 Imagine taking your child or grandchild's drawing and put it on a shirt for them? Or creating a Redwork design of someones home and put it on a casserole tote or blanket to celebrate the purchase of a new home? What if you could create your favorite flower in 3D to stitch entirely in the hoop and make embellishments for pins, headbands, hats, purses or even on quilts? Consider creating Redwork images of your family members for a memorable family quilt.What if you could take purchased designs and re-size them to suit your needs? The possibilities are endless with embroidery digitizing software. Digitizing software is the key to expanding your creativity! 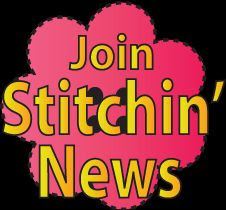 And the best news is that most new embroidery digitizing software packages write designs in many different formats. This means you are no longer limited to the software that is made by the company who created your embroidery machine. Why is this important? If you own more than one brand of machine, one software can be used for all. I always recommend supporting your dealer however if you live in an area where there is no dealer support you can go elsewhere. You can find software that supports your machine file format, offers lesson support and works with your budget. Do you know the tools in your software and feel comfortable using it, then you may be interested in entering to win my new embroidery Craftsy Class for FREE before it launches on March 18th! 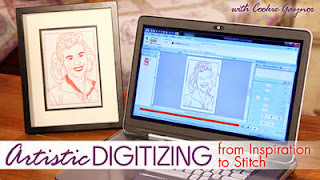 Artistic Digitizing Enter now!